-With the exception of that sideways shot released a while ago, we haven’t gotten a good eyeful of the guy who’s playing Finnick in The Hunger Games: Catching Fire. 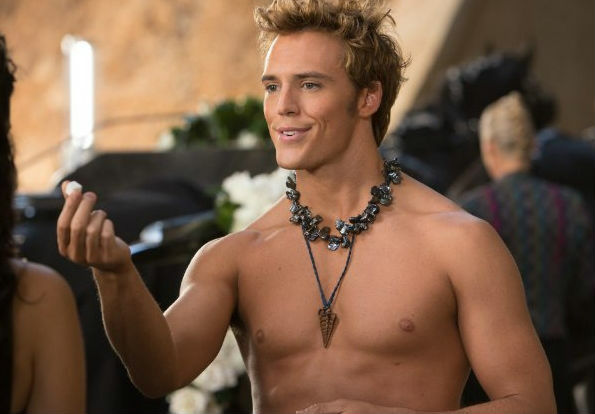 But now Lionsgate has released a better photo of him…and it’s not bad. He’s no Jesse Williams, but he’ll do. –Jennifer Lawrence spent a portion of Comic Con’s Catching Fire panel talking about snot messing up her kissing scenes with Josh Hutcherson, so that’s pretty boss. -In other Comic Con news, the always awesome Bryan Cranston wore a Walter White mask and wandered around chatting with fans, who had no idea he was the real deal. –This is the best photo that’s ever come out of Comic Con. Anyone else kind of feel like this sums up Tom Cruise‘s entire life these days? -Also at Comic Con, Zoe Saldana tried to make a denim jumpsuit work, failed miserably. –Kate Middleton just had a baby boy. Twitter is overheating as we speak. -I’ve got mixed feelings about this: THR is reporting that Cory Monteith‘s final film will debut at TIFF. -This might be the thinnest I’ve ever seen Colin Firth. I don’t like it. –O.J. Simpson wants to team up with Charlie Sheen? No no no no no no no no no no! –Florence Welch showed up at a random cover band’s party, got drunk, and sang “Get Lucky.” Turns out she doesn’t know all the words either. –Helen Mirren doesn’t have a daughter, but if she did she’d give her the most awesome advice ever. –Lindsay Lohan‘s mother has been banned from participating in her rehab treatment after a drunken phone call a few weeks ago. Sounds about right. -Friends are reportedly worried that Emma Roberts is following in Lindsay’s footsteps. -Hugs from Beyonce should carry medical warnings. One fan fainted following her warm mid-concert embrace. -In case you missed it, Full House‘s Jesse and the Rippers reunited on Fallon Friday night. Lori Loughlin showed up at the end for a smooch, because those two just can’t stop trolling us.